Technology Ventures Inc (TVI), a well recognized and one of the fastest growing small businesses by Inc. 500, has come up with an idea that will help exporters gain maximum profit from setting up in a Foreign Trade Zone. 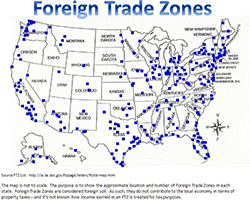 Exporters now have the auspicious opportunity to save their dollars with Technology Ventures Inc's foreign trade zone and outsourcing. The biggest of all benefits an exporter can have is that they do not need to pay any custom duty on a contribution to manufacture final products for foreign market. Also, there is no need to go through the procedures with Customs. Foreign trade zone allows companies to function on their regular to-do list with no worries about Customs holding up their inbound and outbound.